John Huss was born in Bohemia (now part of the Czech Republic) in around 1371. During his boyhood the writings of Wycliffe were being circulated in Bohemia. In 1382 King Richard II of England had married Anne of Bohemia, who had a love for the Word of God, and who helped the writings of Wycliffe enter Bohemia. Huss had a great intellect and received a master's degree from the University in Prague in 1396, became a professor of theology in 1398, was ordained to the priesthood in 1400, and was made rector of the University in 1402. By studying the Word of God and Wycliffe's writings, Huss became concerned about the abuses in the church. Two cartoons also had an effect on Huss's thinking. One depicted the Lord Jesus wearing a crown of thorns and the Pope wearing a crown of gold, and clothes of rich purple and silk. The other showed the Lord Jesus saying to a woman 'Thy sins are forgiven thee' contrasted with the Pope selling indulgences to the people, the practice where people could buy forgiveness for their sins. Hus spoke out against indulgences, and a dispute arose within the University. In the dabate, Huss quoted from Wycliffe's writings and said that no Pope or Bishop had the right to take up the sword in the name of the Church, he should pray for his enemies and bless those that curse him, and that man obtains forgiveness of sins by true repentance and not by money. A few days after the debate was held, some of Huss's followers burnt the Papal bulls and said that Huss should be obeyed rather than the Church, which they described as a fraudulent mob of adulterers. The Church's response was to behead three men who called the indulgences a fraud. These men were later viewed as the first martyrs of the Hussite Church. Huss became the preacher in the Bethlehem Chapel in Prague, where services were held in the language of the people, rather than Latin. Huss denounced the superstition and sins of many of the clergy, and preached from the Word of God. The Archbishop of Prague denounced Huss and his writings and set fire to Huss's writings in the courtyard of his palace. Huss was asked if he was prepared to obey the Pope's commands. He answered that he would 'so far as they agree with the doctrine of Christ, but when I see the contrary I will not obey them, even though they burn my body'. 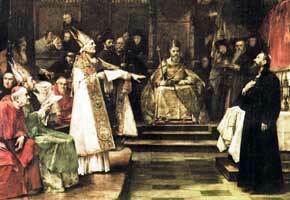 The Pope excommunicated Huss and in 1414 he was summoned to appear for trial before the Council of Constance. The Emperor Sigismund guaranteed Huss's personal safety, even if he was found guilty of heresy, but a month after his arrival in Constance, Huss was arrested and imprisoned. During his trial he was shouted down when he attempted to speak, and the sentence was passed that Huss and his books were to be burnt. Huss was burnt at the stake on 6 July 1415. When he was taken to the site of his martyrdom he said 'I am willing patiently and publicly to endure this dreadful, shameful and cruel death for the sake of thy gospel and the preaching of thy Word'. The Bohemian delegates to the Council of Constance were angered by the martyrdom of Huss. On their return to Prague led by many of the Bohemian nobles, the Hussites, as they became known, armed themselves, and demanded religious toleration. A fifteen year war broke out. In 1421, their leader Ziska died and there was a division in the Hussite forces with a section wanting to compromise with the Papacy. Out of the Hussite movement grew the Moravian Brethren. The Moravian Church survives to this day, with congregations throughout the world.